You may already have a really beautiful sofa or recliner to boast of, but with the passage of time, their covers become less beautiful from regular wear and tear. Then, your furniture is denied its true place as a beautiful addition to your home. However, with the arrival of SureFit Slipcovers, you can get rid of all these worries. SureFit Slipcovers is one of the most well-known suppliers of ready-made slipcovers and associated furniture accessories. Covers are available for sofas, loveseats, chairs, wing chairs, recliners and futons, just to name a few. The fabric used for making these slipcovers is machine washable and is taken from the upholstery market, providing you with the latest fashion and design. SureFit Slipcovers offers only the best quality products, ensuring that customers are happy. After all, complete customer satisfaction is the primary aim of SureFit Slipcovers. The accessories that they offer to customers include memory foam, accent pillows, rugs, accent furniture, table attire, lamps, drapes and tuck-once products. 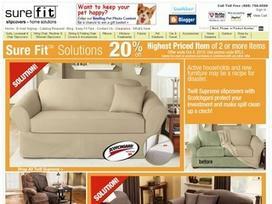 To shop from the comfort of your home, visit SureFit Slipcovers' Web page. All their available products have been organized into several categories to enable quick and easy searching. Shop for products by room, by color or by price. To learn more about SureFit Slipcovers as a company, check out their 2-minute overview video. Or, for less-than-savvy Internet users, request a catalog to view all their items offline. For your sofas, you can choose from SureFit Slipcovers stretch covers, t-cushion covers, one-piece covers, separate seat covers and furniture throws. The stretch royal diamond t-cushion is made of polyester and spandex. The plush material makes the sofa very comfortable; its diamond pattern gives any room a modern look with a traditional feel. It comes in four colors: chocolate, wine, gold and sage. In the loveseat category, the stretch pique separate seat cover is also made of polyester and spandex. It has a soft waffle-textured form-fitting fabric, which is perfect for uniquely shaped furniture. With this product, all your cushions can be placed under a single cushion cover, which is then zipped closed, giving your piece a semi-custom look. In the rugs category, the canyon mosaic rug is made of heat-set polypropylene and has a beautiful color combination. SureFit Slipcovers has been declared one of the top 500 retailers by Internet Retailer and is known for having great prices on all their products. Customer care representatives are waiting to answer any questions you may have by phone, mail or email. Share what you think about SureFit Slipcovers, and your favorite ways to save there!